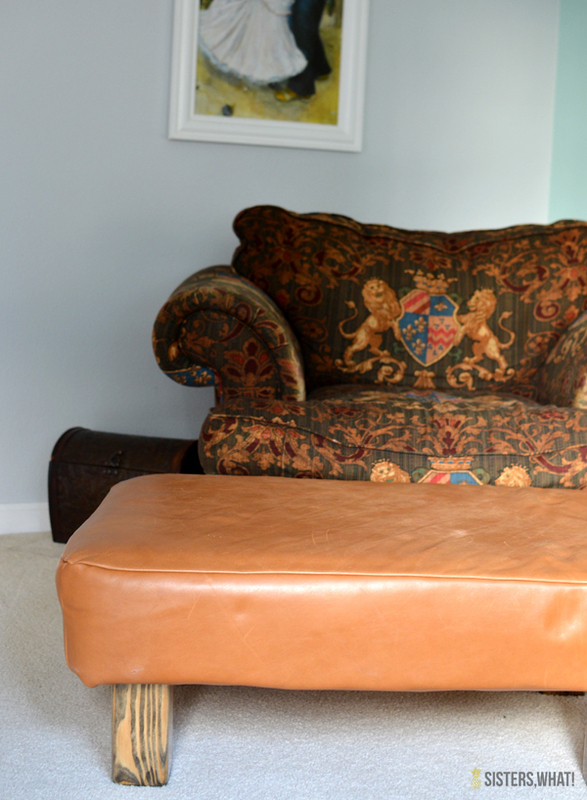 ' Ottoman Make Over with Upholstery Leather - Sisters, What! You know how kids have that super power in which everything they touch goes from being clean to dirty in like 2 seconds? My kids (who I think are fairly clean kids) have this power down to a science. Even after we washed their hands and face after every meal, they still manage to get the furniture dirty. 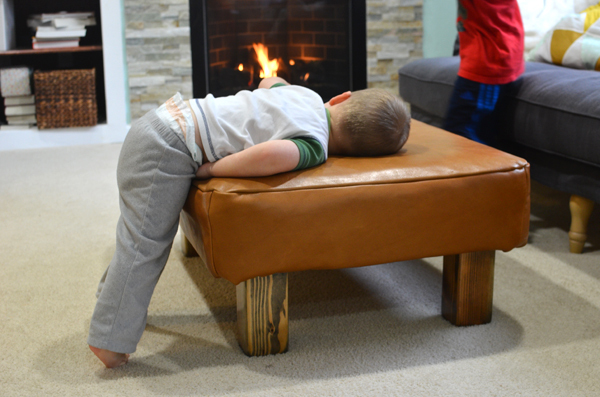 But it's no big deal because our furniture has always been kid friendly (used or cheap). One day we'll have the really nice couch that we don't have to worry about slobber or spit up or the mysterious to get on it. 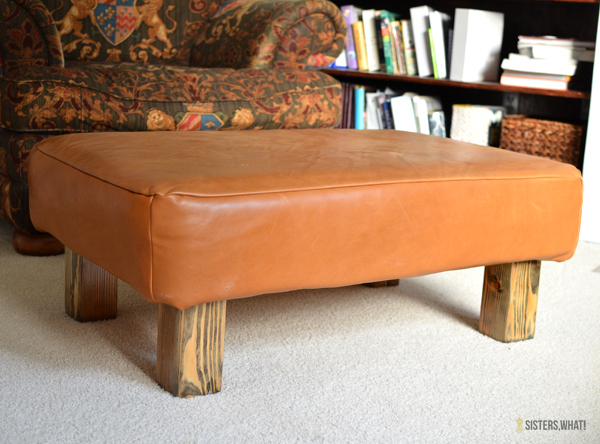 A few years ago, my husband and I made this ottoman together (well he did most the manual labor). 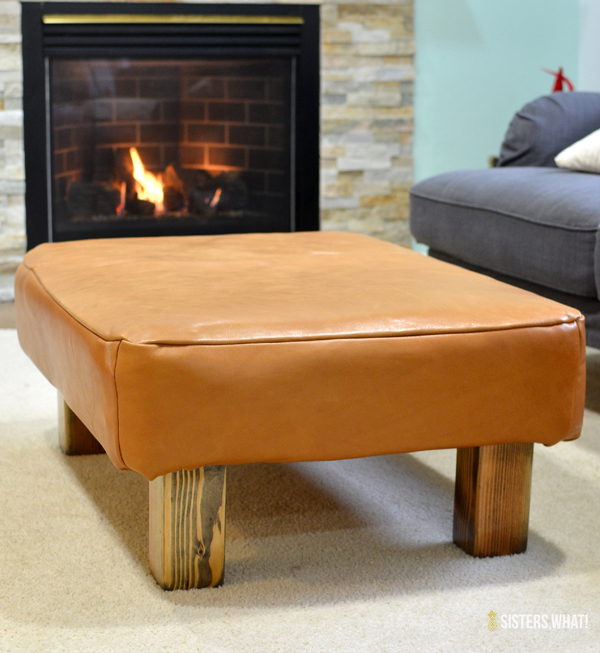 It was one of the first projects he has made so it's pretty simple but very sturdy. 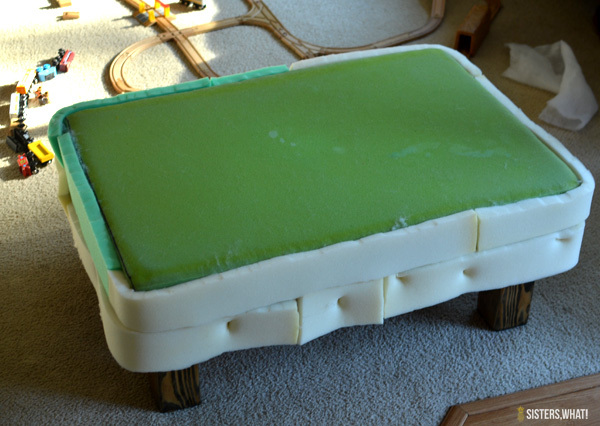 It was perfect for little ones to jump on and off without worrying about breaking it. The fabric on it however didn't make it past the first marker. We made it about 3 months before that wonderful dry erase marker made an appearance. A few months later, spit up from the innocent new babe. Finally, I couldn't take it any longer. It needed to change. Either we needed a very dark fabric, a fabric I could easily wash, or we could try out upholstery leather. The more we thought about it, the more we loved the idea of doing leather. Leather would last longer, easier to wipe up messes and it would look great. The Leather Hides Store ended up having just what we needed. I contacted them first and explained our situation. Just one look at the picture I sent them, they were able to guess the almost exact measurements of our ottoman (talk about a super power). They then sent me a few samples of ones I thought I would like and helped me find the right piece of leather perfect for upholstery situations. After a looking at the samples, they were quick to send me the one that we wanted and just enough for the project. It was perfect! I highly recommend them if you're looking for large pieces of leather remnants. 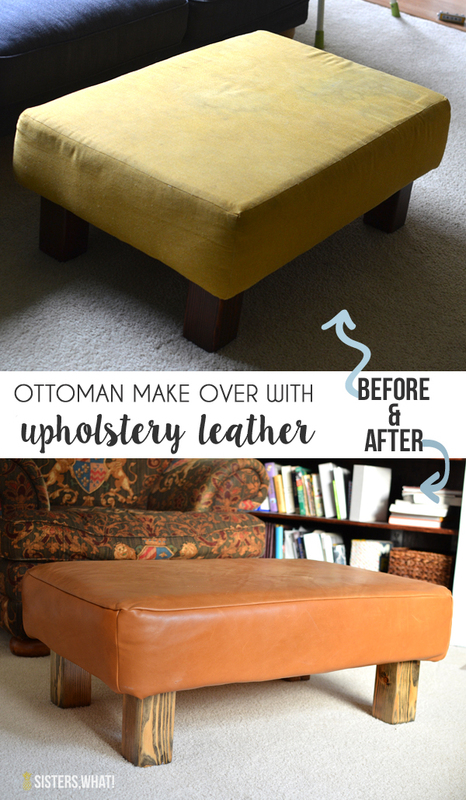 See below on how we reupholstered our ottoman. 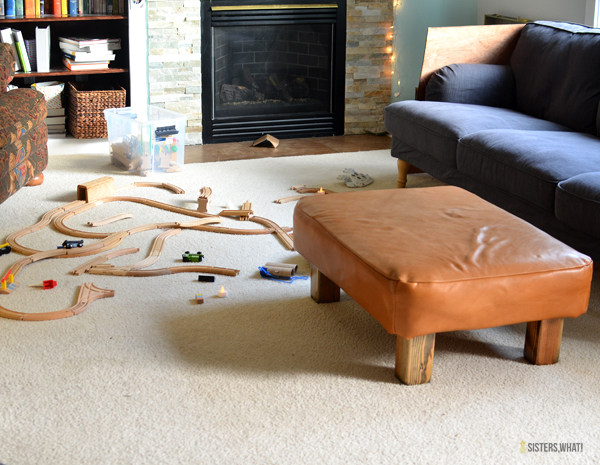 And just to keep things totally authentic, here is a lovely picture of what the room looked like before and immediately after I took pictures of the ottoman. This just happens to be the room all the littles like to congregate in and share their messy love with all. Gosh, let's be honest, the whole house looks like this 77% of the time. Foam - thick foam for the top and thinner foam to wrap around the sides. ***If you're interested in building it yourself I'd be happy to have my husband help me write up a tutorial how what he did and all the dimensions. You can see in the pictures below the basically what he did. 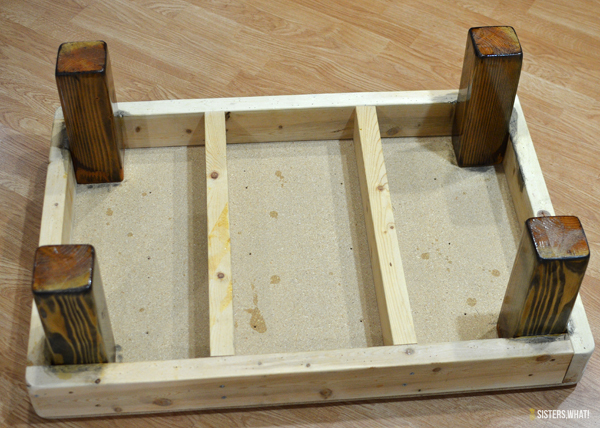 He used 2x4s, a thick piece of plywood for the top, and 4x4s for the legs. Very basic. Let me know if you're interested in the dimensions and more detail how to. 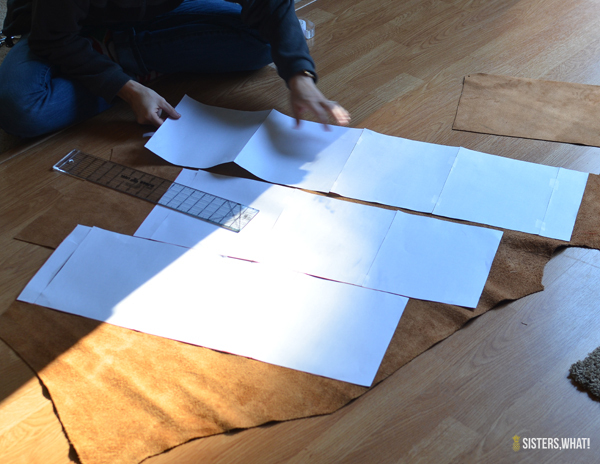 ||1|| since we were redoing the fabric, we decided the color of the legs we had previously wouldn't match the new leather. So we decided to sand them down and do a new color. I thought a black stain would look great. But even though we have stained many other things, the legs didn't stain as we expected. Meaning we probably didn't sand it enough, we didn't something wrong or we can just blame it on the wood. BUT mistakes aside, I actually loved how the stain took to the wood leaving the high contrast look in the wood. 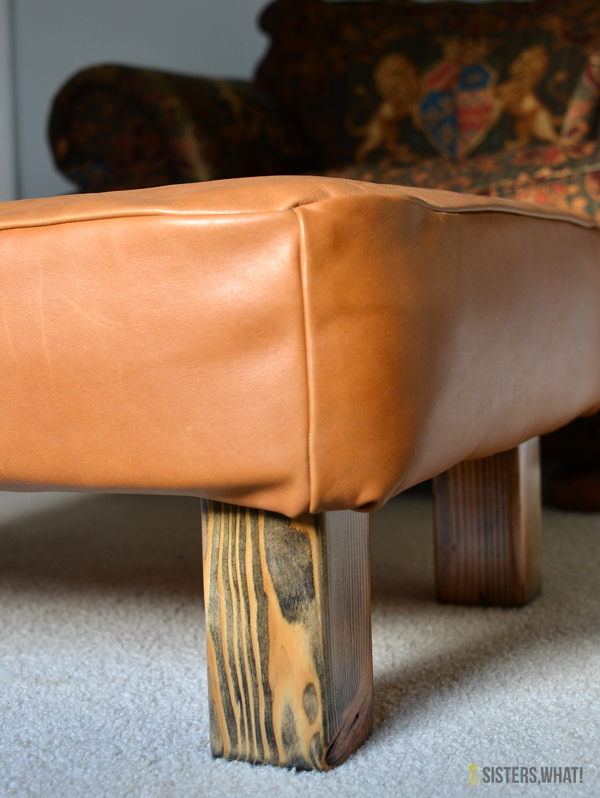 ||2|| Once we got the legs completely done and sealed with polyurethane, we tackled part two: the leather part. I must admit, I was REALLY nervous about this part. Fabric is one thing to mess up on, but there could be no mistakes with cutting this leather or sewing it. It had to be close to perfect. Just remember: measure twenty times cut once. That is exactly what we did. We measured the sides and the top and added a 1/2 inch seam allowance to the sides (we barely had enough for even that). Then say a prayer and cut it out. 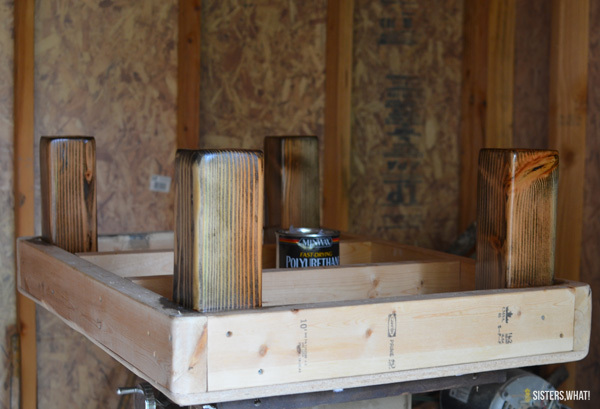 We ended up with 2 long sides and 2 short sides and one big piece for the top. 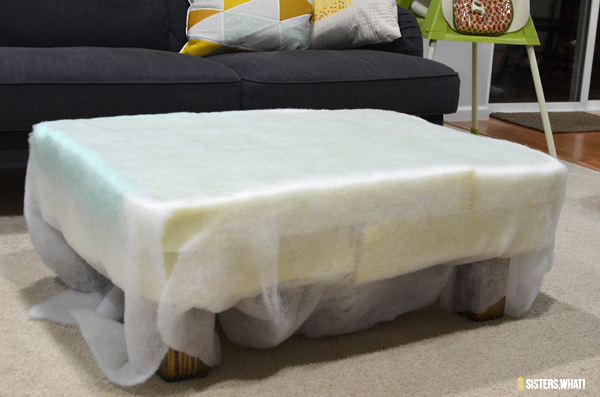 ||3|| Now grab your thick foam and cut it so it fits perfectly on top of your ottoman with no overlapping (sorry, I forgot to take a picture of that). Next grab your thinner foam (we used 1 inch) and wrap it around (it needs to be wide enough to reach from the wood base of the ottoman to the top of the foam). And yes, you do see correctly; we have two pieces, but that is because we didn't have enough initially so we ended up with two rows, don't do what we did, make it one wide row. Staple or glue the foam to be held in place. take your batting and put it over all of that and wrap it underneath and staple to the bottom. Cut excess. ||4|| Now the fun part. So fun my husband left me all alone to face the leather alone. Ok it really wasn't that bad. I knew what needed to be done and I was super careful and slow. I first started by sewing all the sides together using 1/4 seam allowance first (there is now unpicking leather because those holes are permanent and very obvious). 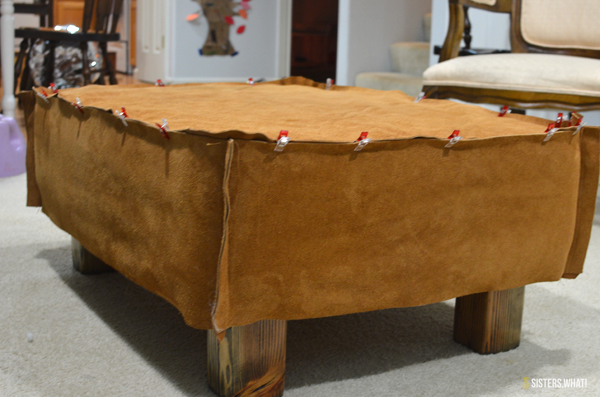 After I sewed all the pieces I placed i sides on the ottoman to see how it fit. I determined it need to be slightly tighter sew I added another 1/4 to each side. After I was done with the sides, it was time for adding the top, da da DAH! For this, I was SO grateful for these precious quilters clips that my sister in law gave me a few years ago. Seriously, super invaluable for this project since pins were not an option. I carefully placed the top on and clipped it all the way around until if fit snuggly and then sewed it on. It took me a few times sewing different parts to be satisfied with the fit. The leather was definitely a little trickier than regular fabric, but I was happy to find out that it isn't as slippery as I was worried it might to sew with so much at once. 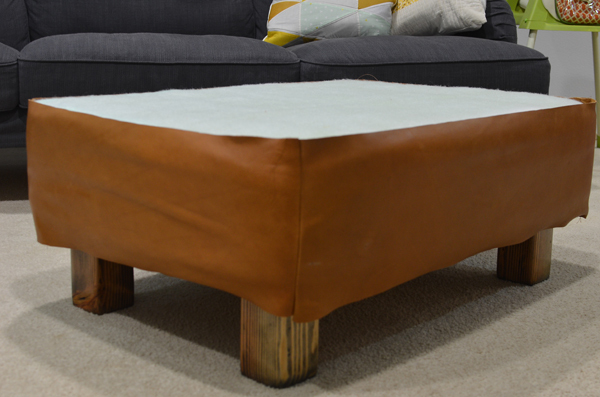 ||5|| Sorry no picture: Place your ottoman upside down and staple the leather to the underside. We clipped off any excess, but let me tell you, this was one of those projects where everything turned out perfect for having just the right amount of leather. And after we stapled it on we were done. See not so hard as it seems. No really, it was actually easy, just as long as we took our time and measured millions of times. We absolutely love and so do the boys. Exhibit a below. This snuggling the ottoman is probably a daily occurrence.